Last night at SMX West, during the keynote conversation with Google's Amit Singhal, Danny Sullivan brought up the knowledge graph a few times and then Dan Barker's tweet about scraper sites. In short, in a nice way, Danny Sullivan called Google the biggest scraper and shared the concern publishers have about searchers not needing the 10 blue links anymore. How did Amit respond? He gave an analogy. He said Google is the swiss army knife and the publishers are the cork screws, screw drivers, etc. While Google is able to give you a tool that does a quick job, if you want to do the full job, you need to break out the real tools and dig in. So you learn a little on Google with the knowledge graph but if you need more research, you need to go to the links and click on the sources and learn more. Personally, I kept finding it funny Amit using the "screw" drive and cork "screw" association to publishers. Yea, publishers do feel "screwed" and him using those words didn't help. But his analogy, while it stinks, is true. 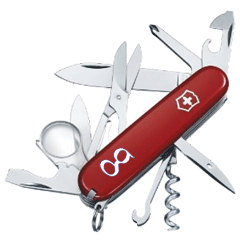 The problem is, 90% of searchers want the quick fix and that quick fix, is provided by Google's swiss army knife (i.e. knowledge graph) and the cork screws (i.e. the sources of the content) are screwed.